This luxurious pasta dish is simple to make and perfect for your Valentine. Reduce the amount of garlic if you're concerned by the quantity - though it doesn't matter if you both eat it! 1. To cook the lobster, bring a sauté pan of water to the boil, add the tails and cook for 5 minutes. Remove and plunge into a bowl of iced water until cold. Check the lobster tails are cooked: the shell should go from a blue/pink colour to bright red and the meat from translucent to white and opaque. 2. Cut each tail in half straight down the middle so you have 6 pieces of lobster in their shells. 3. Meanwhile, bring a large pan of water to boil and cook the linguine according to pack instructions. 4. Heat a large sauté pan, add the olive oil and gently warm with the garlic and chilli until the garlic starts to turn golden but doesn’t burn. Add the tomatoes, followed by the lobster tails in their shells and toss until hot. 5. 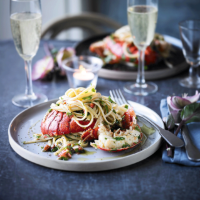 Remove the linguine straight from the pan into the lobster mixture along with 100ml of the pasta water, shaking the pan and tossing the pasta so the liquid emulsifies. Serve with the fresh parsley sprinkled on top and an extra drizzle of olive oil.